In order to obtain maternity benefits, a mom in Serbia needs over 100 documents; long, complicated and demanding procedure to claim these benefits cost Serbian economy 690 million dinars per year. This domain is regulated by the Law on Financial Support to Families with Children. Although the law governs the systemic, monetary, and the time frame of the help for working mothers and pregnant women, the time limits set by this law are violated every day. This especially affects families with small children whose monthly incomes are being reduced by the maternity pay; this happens at a time when their cost of living is increased. Inefficiency and tardiness of financial support are caused by the bureaucratic procedure, according to which the payment of maternity benefits is done by the employer and with subsequent reimbursement by the competent national authority – Ministry of Labor and Social Policy of the Republic of Serbia. Slow and delayed transactions of monetary compensation benefits are compounded by the non-compliance with the Act by employers or by the delays in the refunds by the regulatory authorities. Rights for Moms Campaign is committed to the realization of all maternity benefits while simplifying the procedures, both for moms and employers. 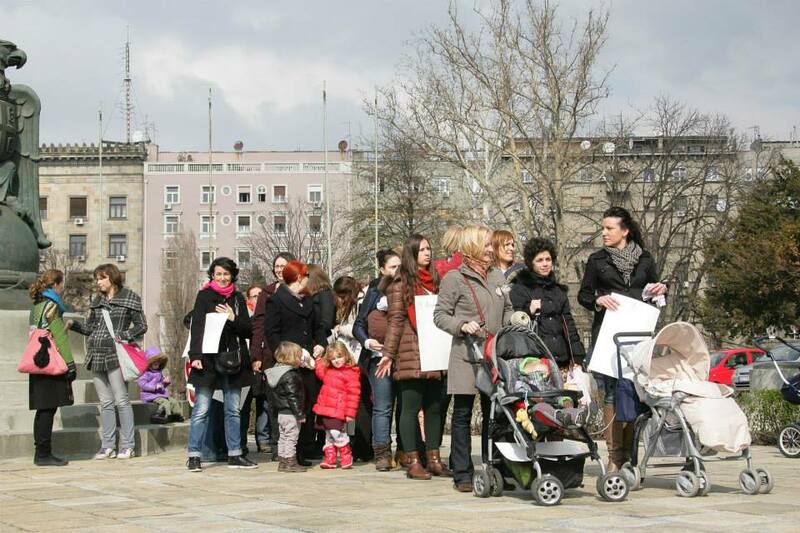 The goal of the campaign is – working moms regularly receive compensation during their maternity leave, through the direct payment from the budget of the Republic of Serbia to their accounts, instead of going through the accounts of employers. We will achieve this by changing the Law on Financial Support to Families with Children. On one hand, this will cause that working mothers will no longer wait for several months to receive their payment after the childbirth. On the other hand, this will bring changes for the employers, too. They will be relieved of the bureaucratic procedures related to the exercise of the maternity benefits. Finally, this will stop the bad practice of lending citizens’ money to the state. In order to reach this goal, we gathered and organized 250 moms and pregnant women to publicly talk to each of 250 MPs and convince them, using their personal experience, that it is necessary and urgent to change the law. They received the support of most MPs. Besides the support they got from 150 MPs at the Serbian Parliament, moms were also supported by Serbian Minister of Finance Lazar Krstić as well as by Aleksandar Vulin, Minister of Labor, Social Affairs, and Veterans. After the meeting with representatives of the campaign „Rights for Moms“ (associations: Serbia on the Move – Ana Babović and Nataša Čorbić; Parent – Bojana Selaković and Center for Moms – Jovana Ružičić), Serbian ministers backed up the initiative which advocates that the Law on Financial Support for Families with Children, clause 13, should be immediately altered. The promise was that this clause will be changed by the end of 2014. Shortly after, a working group for amendments to the law was formed. This working group accepted the demands of the campaign – the proposal that salaries of working moms after childbirth should go directly to their accounts, without the involvement of employer. However, despite the commitment and the effort of many members of the working group, due to poor coordination of the state institutions and their representatives, changes to the other parts of the law have not yet been harmonized. Therefore, the law itself did not enter the procedure by the deadline. Associations “Serbia on the Move”, “Parent” and “Center for Moms” who have conducted the campaign, urge Minister Vulin and employees of the Ministry of Labor, Employment, Veteran and Social Affairs to urgently take responsibility and make the work of the working group more efficient in order to change the law with the shortest possible delay.